Soundboard releases are quite scarce nowadays, which makes me appreciate this release more than I would have only 3 years ago. On the other hand, I will always welcome a soundboard from 1977. Although not in his greatest shape, these documentations of Elvis' concert performances are more fascinating than many other soundboards from earlier years. Unfortunately this soundboard is more incomplete than any other incomplete soundboards so far. From the mouth of the producer only 20 seconds of 'Hound Dog', solo numbers by Sheril and Kathy and 'Can't Help Falling In Love' was still available. The solo numbers has severe sound problems it is said. And 'Hurt' which we are used to hear Elvis sing, was not performed this day, thus lacking. This is the third soundboard from April tour 1977. The gig in Toledo on April 23 was released on Goodbye Memphis (disc 2). From the day after, April 24, the concert in Ann Arbor was released on A Profile (disc 4). Both these soundboards were terribly incomplete too! Where Fort Baxter on their Toledo and Ann Arbor CD's added material from other concerts, Vavavoom has instead decided to sell their bootleg at a lower price. A nice touch! Of these three discs I like Ann Arbor best, then Kalamazoo and finally the ultra boring Toledo show. Sound wise this Kalamazoo release is best. The sound is typical for these later 1977 recordings, flat, noisy and overall a bit boring. However, Memories From Kalamazoo is much clearer in the sound than the two others. The CD kicks of with a typical 1977 version of 'Love Me'. Lazy as hell! I actually like these versions, as they bring to light some of the atmosphere in the concert arenas. After 'Love Me' Elvis usually mixed between 'Fairytale' and 'If You Love Me' as the next song. This day he tries both, but ends 'Fairytale' 30 seconds into the song as he forgets the lyrics. Instead he jumps into the more frequently performed 'If You Love Me'. This is the same version that was released on the Moody Blue album after some overdubbing. 'You Gave Me A Mountain' is not performed very seriously, while 'Jailhouse Rock' is surprisingly well delivered. 'It's Now Or Never' is standard delivery while 'Big Boss Man' marks the first soundboard release of this song from 1977. A welcomed addition, indeed! Also for the first time on soundboard is a 1977-version of 'Heartbreak Hotel'. 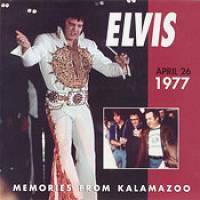 Elvis is really focused on this song, and the total outcome is pleasant, although some microphone problems occur during the performance. These problems has Elvis switch to another microphone after some seconds of 'And I Love You So'. The next attempt on this song proves successful. 'My Way' ends this disc. As always; a great delivery! In my personal opinion Elvis never sang 'My Way' better than late 1977. These April versions are actually quite different from versions some months earlier, where Elvis overdid his use of voice-modulation. 'My Way' is together with 'Big Boss Man', 'And I Love You So and 'Heartbreak Hotel' the best from this CD-release. As pointed out above, the lack of new soundboard releases lately makes me welcome these Memories From Kalamazoo. © Oven Egeland, Elvis In Norway, June 12 2001.